What Are the Best Seth Rollins Trading Cards? By closing out Wrestlemania 31 with the WWE World Heavyweight Championship held high, Seth Rollins became a king of professional wrestling. A standout on the indie scene before breaking into the WWE as a member of The Shield, Rollins is strong in every regard. He's got the moves, the look, the mic skills and an "it" factor that's rare. And if you're looking to collect Seth Rollins cards, it's still relatively reasonable to get in on the ground floor -- even when it comes to his rare early cards. Shop for Seth Rollins cards on eBay. Seth Rollins cards date back to 2010 when he was Tyler Black in Ring of Honor. His first as Seth Rollins came a year later in his early days with WWE developmental promotion, Florida Championship Wrestling. Once he got the call up to WWE as a part of The Shield, the floodgates opened with regards to Seth Rollins cards. He now has a growing number of readily available base cards, inserts and premium cards like autographs and memorabilia cards. And now that he's entrenched in the main event scene, expect it to continue to grow. If you're looking for the first Seth Rollins trading card, you need to look up the name Tyler Black. In 2010 he was the ROH Champion and appeared in the 2010 Missouri Wrestling Revival set. Sold directly through the MCW website, it was part of an evolving release. Needless to say, it doesn't have the same sort of print run as his later WWE cards. 2011 FCW Summer Slamarama is a classic modern wrestling set. Given away at live events for a short time, most were either tossed aside or forgotten about. Lots of fans also used them for collecting signatures. Finding a clean, unsigned copy of the first "Seth Rollins" card is extremely tough. Prices are strong for singles from the set, which also includes some of the earliest cards of his former Shield members Roman Reigns and Dean Ambrose. 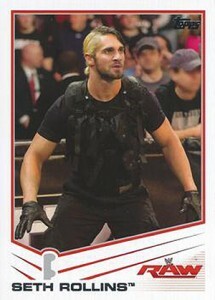 2013 Topps WWE has the first "big league" Seth Rollins card. For that, it's more notable than it is valuable. It also has several parallels that bring a chase element, especially the rarer ones that are serial numbered. It's not the prettiest signature in the world, but it's not like there are a lot of options when it comes to Seth Rollins autograph cards. 2013 Topps Best of WWE has his first signed card, which is done on a sticker. Rollins also has a scarce dual autograph in the product with Roman Reigns. Besides have his first autographs, 2013 Topps Best of WWE also has Rollins' first memorabilia card. The Swatch Relic has a piece of an event-worn shirt embedded in it. Don't expect a lot of color though as Rollins likes to dress in black. 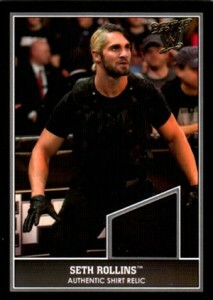 This is the second Seth Rollins autograph card. Like the one found in 2013 Best of WWE, this one also relies on a sticker. The image of Rollins hoisting his Money in the Bank briefcase makes it a more significant card for those more concern with history than having something that's "first." For those looking for interesting and rare Seth Rollins inserts outside of autographs and memorabilia, 2014 Topps Chrome WWE has a few. Like any modern Topps Chrome set, there are several parallels including a Gold Refractor (#/50) and a one-of-one SuperFractor. The Shield is also featured on a Championship Belt Plate card. A short print, there are only 25 copies of the card, though. A Shield belt plate? I’ve never seen it. Please provide a link or something to prove this is actually true. David � I believe I saw one listed on eBay shortly after the set came out but I couldn’t find an image now. It is on Topps’ official checklist as well as a mention in an email confirming the short print. With just 25 copies, there are few to begin with.